Staffordshire Tableware Calypso pattern 4 x side plates measure approx 18cm wide. 1 x salad / dessert plate measures approx 20.20cm wide. These are used but good. A manufacturer flaw to a side plate and the dessert plate see last 2 pictures. Cutlery marks can be seen when tilting into the light. Fully back stamped. Made in England. Previously used, in very good condition. 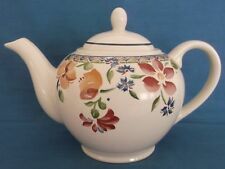 Very small nick to base of teapot (see photographs). Made in England. Collection in person available. STAFFORDSHIRE CALYPSO milk jug / creamer - just out of storage MADE IN ENGLAND TABLEWARE: 11cm tall. Dispatched with Royal Mail 2nd Class. Although there may be very minor signs of wear (e.g. faint cutlery marks visible in certain lights), these do not detract from the item's appearance. One of the plates does have a mark to the rim as shown in the photograph. Although there may be very minor signs of wear (e.g. faint cutlery marks visible in certain lights), these do not detract from the item's appearance. The sugar bowel has a minor defect to the lid as indicated in the photograph, There is also a tiny defect in the body of the sugar bowel but this can hardly bee seen. Item:Tea / Side Plate. May include seconds.